Direct Billing = Extra Convenience! Chiropractic is a hands on drug-free approach to relieving back pain, neck pain, headaches and many more complaints. We achieve these results through a variety of techniques and methods. 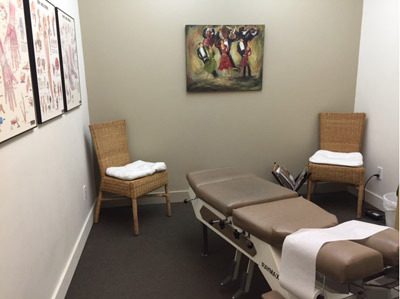 However, what sets us apart from other manual therapists is our use of spinal manipulation . We use spinal manipulation to restore movements to joints that have become stuck or hypomobile due to a result of tissue damage or injury. These can become injured due to a singular event such as a car accident, or it may occur as a result of a series of small cumulative stressors—such as sitting slouched in front of your computer! In either case the result is tissues which are injured and will result in alteration of chemical and physical changes. This results in inflammation, abnormal function and resultant pain. Manipulation helps to restore proper function of the spine and thereby allows the body to heal itself. Manipulation rarely results in pain, however mild discomfort and achiness may result- if this happens be sure to let us know. Often patients will experience a greater sense of well being as well. Research has demonstrated that Chiropractic has far more reaching results in treating many complaints, which are not musculoskeletal in nature due to our ability to target the nervous system. Contact us today to schedule your consultation with Dr. Hunter.